It will be easy salmon fishing between August-September 2014 on the Fraser River! We're used to having easy fishing around here, location Fraser River Valley Vancouver, British Columbia that is, but this should be ridiculously easy! Why? 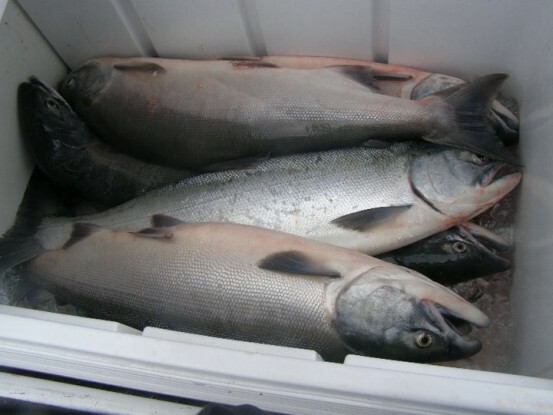 We need to look back at the near record return of Sockeye salmon to the Fraser River in 2010. About 35 million Sockeye returned that year and there was a very successful spawn that fall. Now it's 4 years later and all the survived juveniles will be returning this summer to repeat the miraculous life cycle of the Pacific salmon. Our department of fisheries(DFO) recently issued a forecast report which revealed that the return could be as high as 70 million but it's likely the return will be somewhere between 20-40 million. This will be good news for the Fraser river salmon fishing guide industry which repeatedly has taken blows due to DFO mismanagement rather than lack of fish. We expect to be very booked this summer and fall. Full cooler of Fraser Sockeye! Sockeye salmon are relatively easy to catch on the Fraser River. All you need is a good guide, a boat and your basic salmon rods and reels. The only technique that will get you a hookup with a 'Sock' is called bottom bouncing. Sockeye just don't bite in the Fraser so the BB method is very efficient because it flosses them as they swim upriver. The main thrill of fishing for Socks is catching them because they taste heavenly. Nothing beats a fresh Sockeye and a BBQ! There's lots of work for us guides and lots of hard work, cleaning fish and more fish, scrubbing bloodied floors, tying up lots of tackle, long hours too so the easy part is more for our clients who with a bit of luck can limit out in a few minutes and then go try some Sturgeon fishing for one of the monster river fish that can weigh over 1,000 lbs. This is Brian Mack of Silversides Fishing Adventures and I look forward to showing you our paradise.